In their study of eight Department of Veterans Affairs (VA) medical centers in New England, the authors examined the current use of best practices in inventory management in government, based on a case study of VA hospitals. 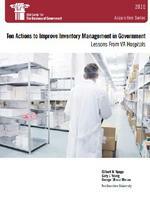 The authors found five major challenges to improving inventory management in the public sector. The key to improving inventory management within the Department of Veterans Affairs specifically, and more widely throughout the federal government, is to apply best practices now used in the private, public, and nonprofit sectors. Such best practices include using predictive analytics, adopting process mapping, establishing a culture of continuous improvement, adopting more effective staff training approaches, and building a culture of teamwork. This report continues the IBM Center’s long interest in both the issue of inventory management and acquisition. Recently Zachary S. Huitink and David M. Van Slyke examined the Better Buying Power initiative in the Department of Defense in their report Beyond Business as Usual: Improving Defense Acquisition through Better Buying Power. We hope that the inventory management leaders, as well as top agency leaders, will find the findings and recommendations in this report helpful in furthering efforts to improve inventory management in government. Read the Federal Times article about the report. Read the Government Executive article about the report.